Western style buildings on Kaigandori (also known as the Bund) in the foreign settlement of Kobe, Hyogo Prefecture. The building on the left, located at No. 2, was for a long time the office of Walsh Hall & Co. Founded in 1868 (Meiji 1) by American trader John Walsh and his brother, the company owned a paper mill in Sannomiya that would grow into the Mitsubishi Paper Mills. 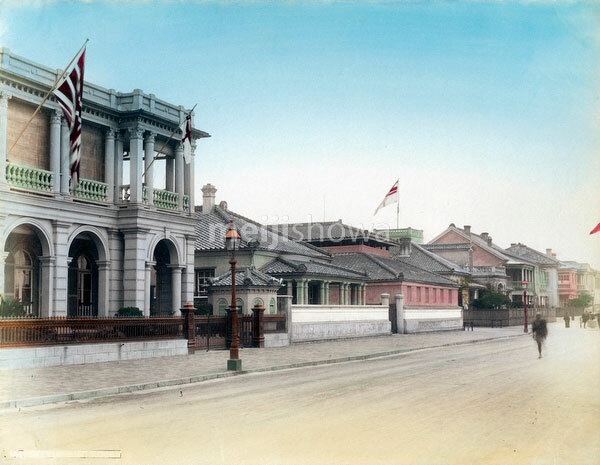 This building was later sold to the Hongkong and Shanghai Bank, which located their Kobe Branch here. Next to it are the offices of the tea exporter Smith, Baker & Co., located at No. 3.